One day away from the 27th Jelling Musikfestival and the beginning of the festival season in Denmark. We know most Danes will go only for what they already know, and thereby miss half of their ticket’s worth. So we at Latebar thought it necessary to help our fellow countrymen find new bright stars (or Sparks) in Jelling 2015. Many famous names and known artists will visit the old Kingdom during the summer. Along with them a lot of not yet so established ensembles will shine too. One of the outfits Latebar will pay closer attention to this week in Jelling is the British duo ‘Bright Sparks‘. And let’s make one thing clear right away – this is not an act you see everyday! Comprised of two classically educated musicians often seen with a very minimal and street-ready setup consisting of a guitar, a drum, and a toy piano. Out of their base in Hamburg, Germany, Ashley Hicklin and Kim Sawford have developed a unique, personal and almost irresistibly catchy sound. Without doing it full justice one may describe it as “something like Ed Sheeran – but without any studio polish or conditioner”. This is music for real people – you and me everywhere and at any given time. Though neither of the two are new to performing and playing music, the constellation ‘Bright Sparks‘ first formed during 2014 with a first EP-release around New Year 2014-15. It was immediately followed by a rather intense tour around Germany, Holland, Denmark, Sweden and the UK. The first tune to hit the radios in Denmark was ‘Sleepwalking‘ – a harmonious song perfectly framing the essense of this 100% no-frills-duo. Authentic singing and pianola-like keys – We at Latebar are in love! A series of unplugged on-location songs (called the ‘Magic Carpet Tour’) were later recorded and makes for some rather entertaining and prestine covers of tunes by Macklemore & Ryan Lewis, MAGIC! and The Monkees (of all). 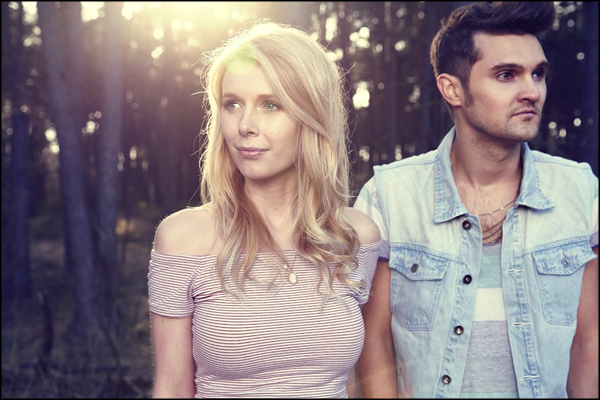 Ash and Kimmy already ties bonds to Denmark, as they recently co-performed with Danish singer Tina Dico in Hamburg – stating on Facebook, that they love her music. And given the fact that they’ve already visited Denmark quite a few times, we can only hope a full album is in the making by Bright Sparks – fingers crossed. Or simply visit their website at: www.ohbrightsparks.com or their channel on YouTube. See you all Sunday by ‘Teltscenen‘ at Jelling Musikfestival 2015. This entry was posted on Wednesday, May 20th, 2015 at 1:45 pm	and is filed under Music - live. You can follow any responses to this entry through the RSS 2.0 feed. You can leave a response, or trackback from your own site.